Roof Of Mouth Hurts - Pain, Sore and Swollen Roof of Mouth (Palate)? Home » Conditions & Disorders » Roof Of Mouth Hurts – Pain, Sore and Swollen Palate? Nowadays, a common complaint that doctors hear from patients is that their roof of mouth hurts. If you are one of these people, this article will tell you about the common causes of pain in your roof of mouth, the respective treatments and even preventative measures you can take at home. But first, you should be clear about what the roof of the mouth actually is. If you use your tongue to feel the top of your mouth, you will undoubtedly feel a difference in texture between the front side and the back. There is a horizontal bony plate in the front part of the roof of your mouth called the hard palate, which you will have felt to be hard. Behind that however, you will feel ticklish if you poke your tongue further back as the latter part of the roof of your mouth is made of soft tissue and is known as the soft palate. Hard palate pain is much less common than soft palate pain as the latter is more sensitive. If you feel alarmed that the roof of the mouth hurts, it is actually a pretty common condition. Usually the pain is accompanied by inflammation or sores on roof of the mouth. The pain is likely to be at its peak when you wake up from sleeping and snoring only aggravates it. Eating hot or spicy food can also make the pain worse. 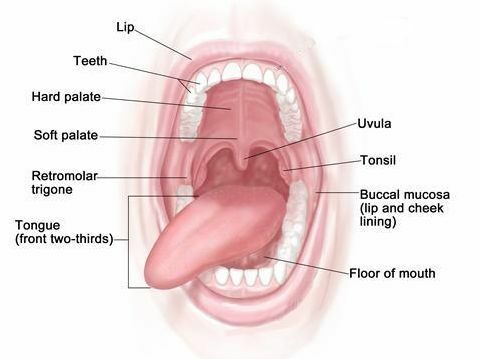 Anatomy of the Mouth – The “Hard palate” is the roof of the mouth. Some people find that the roof of the mouth hurts after they have had a scalding cup of coffee or some really hot and spicy food. Since the roof of your mouth is sensitive, it can easily be damaged if you eat or drink something too hot. You might suffer from a sore soft palate for a few days and in extreme cases a blister can form. If such is the case, you should drink a cold liquid immediately and try to keep it near the affected area to soothe it. Have you ever scratched your palate with a fish bone or a particularly sharp potato chip? The roof of the mouth hurts whenever you eat or chew an irritating substance like tobacco, as the tissue is soft and can be easily damaged. Spicy food only aggravates your condition so try eating bland, soft foods like bananas to prevent further irritation. The roof of the mouth hurts usually when you have a bacterial or viral infection like strep throat, sinus infection, thrush or even the common cold. Your sore roof of mouth may be due to bacteria from a throat infection invading the flesh of your mouth. In order to treat the roof of mouth pain you must treat the infection. Along with the antibiotics your doctor prescribes, eat foods rich in Vitamins B and C to strengthen your immune system and heal the sore. The pain in the roof of the mouth may be due to some ill-fitting dentures or other oral devices. Even a tooth abscess can not only cause an ulcer but the infection can spread to the palate and lead to a sore on roof of mouth. This is a condition that is characterized by the sensation of a dry mouth. In most patients roof of the mouth hurts but the cause of the disease is unknown. It occurs mostly in postmenopausal women. Research has found that use of Alpha-lipoic acid, an antioxidant found in spinach, broccoli and potatoes has led to significant improvement in symptoms. Also known as fever blisters, these small, painful blisters are mostly caused by the herpes simplex virus. Not only does the patient find that the roof of the mouth hurts but he might also find his roof of mouth swollen. Cold sores usually clear up without treatment but topical treatment of an oral get containing ethyl ether can numb the pain. These are small shallow lesions that are not contagious but are painful. Often when the roof of the mouth hurts, there is a canker sore on roof of the mouth. These can be caused by stress, mouth injury, food allergy, hormonal changes or the deficiency of vitamins and minerals in diet specially folic acid, iron or Vitamin B 12. Usually canker sores go away by themselves; however in severe cases your Doctor may prescribe medicines called corticosteroids or a strong Chlorhexidine mouthwash. The lump on the roof of mouth may be a palate tumor. Don’t worry though; it won’t just be any painful bump on the roof of mouth. If you notice swelling in the roof of mouth that increases rapidly or a color change, you should seek immediate medical attention. Mouth cancer can be either lymphoma or melanoma. A lymphoma spreads from the tonsils or the tongue so the patient will find that the roof of the mouth hurts excessively. An oncologist will guide you to the treatment best suited to you which may be radiotherapy, chemotherapy or even surgery. Avoid hot and spicy foods to avoid further irritation. Avoid chewing tobacco and drinking alcohol. Tobacco can cause scratches and alcohol only exacerbates sores. Stop smoking. When you smoke, a thousand tiny irritants go in to your mouth and throat that damage the sensitive tissue. Many smokers find that the roof of the mouth hurts more after smoking. Control your stress levels as it can cause canker sores. People who meditate or do yoga daily rarely find that the roof of the mouth hurts. Gargle with cool, salted water to ease the pain in your sores. People whose roof of the mouth hurts even find relief by swishing cold milk around their mouth. Apply the gel found within an aloe vera leaf on the sores for fast relief. People who find that the roof of the mouth hurts often have Vitamin B deficiency and should take a supplement. When should you see a Doctor if your roof of mouth hurts? Now you know what to do if someone tells you ‘the roof of my mouth hurts’ or ‘the roof of my mouth is sore’. However there are some conditions in which you must seek medical attention. If you have pain in drinking fluids. If you have unbearable pain. If your sores spread or change color. If you already have HIV or cancer. If white patches appear on your tongue or palate. If you have other symptoms like rash, fever or difficulty swallowing. How to relieve sore muscles after workout?